USB is popular scrim vinyl banner with interior/outdoor printing and popular for banner stand graphics, retail point of purchase and small-large sized banner signs with high definition grand format printing results. 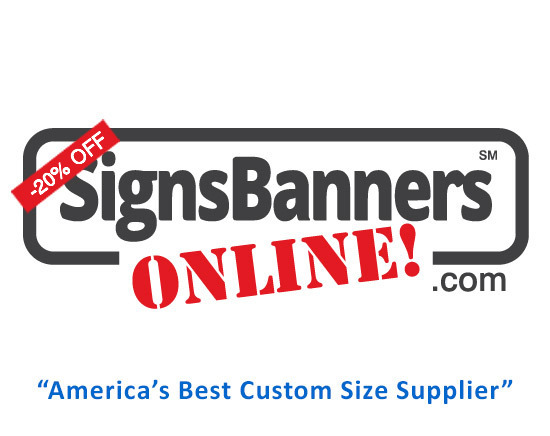 Signs Banners Online are now the leading supplier of vinyl banner brands in the world! 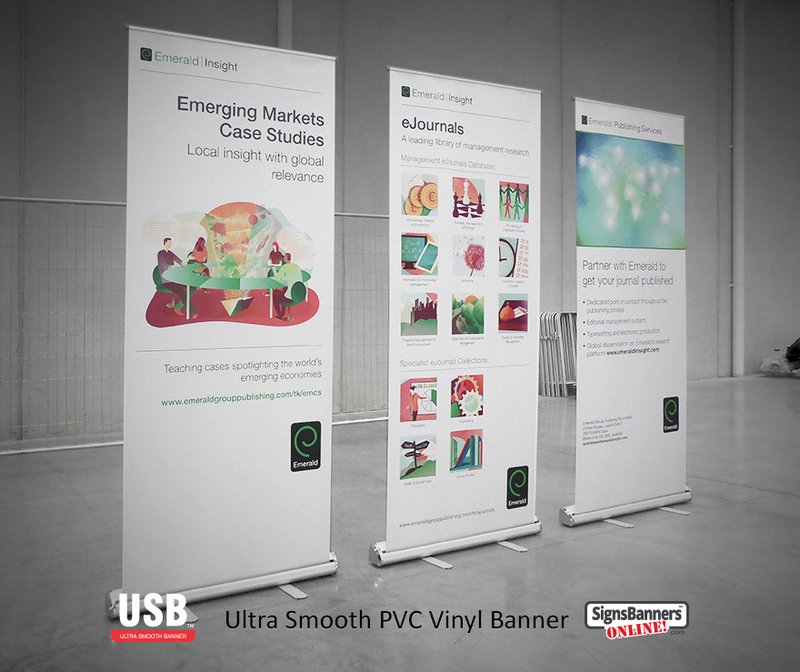 USB is a semi-blockout and is popular for hanging retail and store Window SALE banners and poster ideas. Retracting and X stand, Media and interview, product expo and presentation. 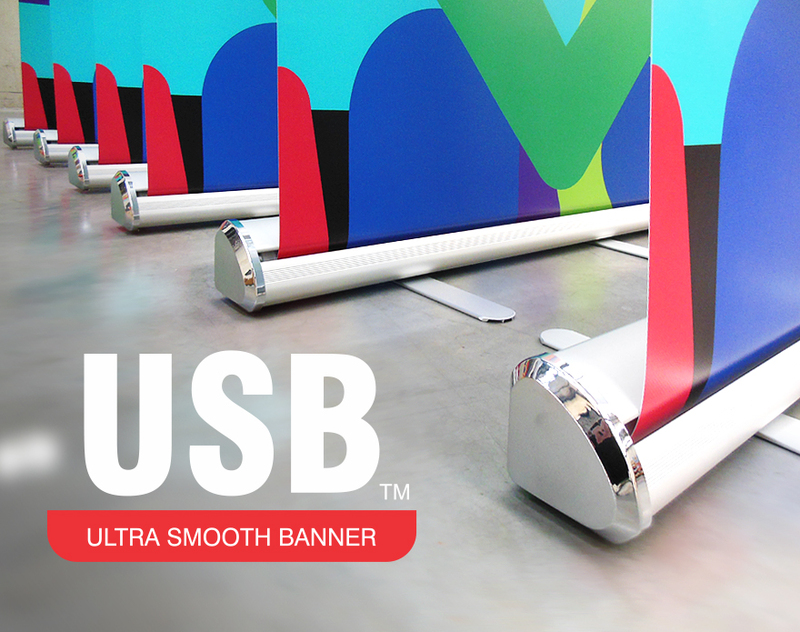 USB Ultra Smooth PVC Vinyl Banner is a smooth scrim pvc vinyl with inherent internal weaved structure as a minimum lay. 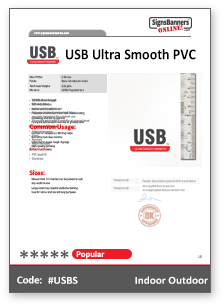 PVC is popular with general signage companies due to it's relative ease of production and relative looks however many differing qualities will make the product a success including finishing such as print coat definition for which USB is famous. "SBO often use over 200 rolls per month ensuring you receive newest material that works. With many generic copies out there, it's good to know SBO use the best foundation materials for their clients." "Fantastic Service - Great Product - Such a pleasure to deal with." 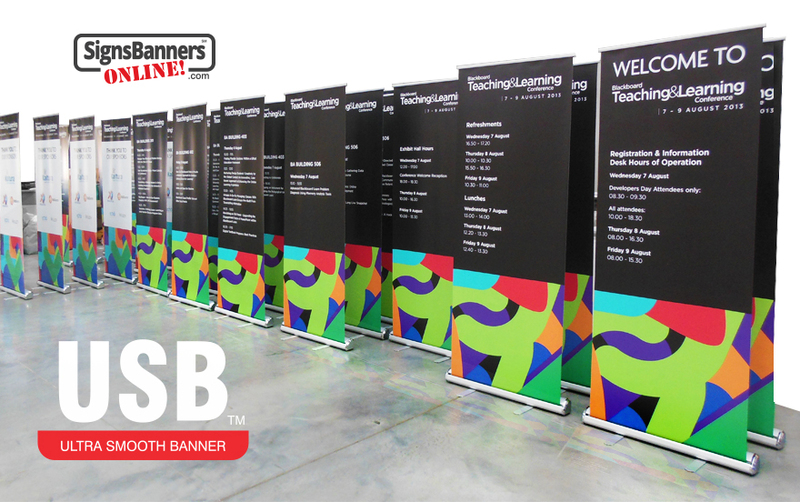 "Their ultra smooth pvc banner is a superior product for banner stands. Non curl and looks better." #1 Maxi sizes are joined from master 5' 1.55 metre rolls. #2 YES. You can use all options including pole pockets, hems, hook loop, tongue and knife edge only. 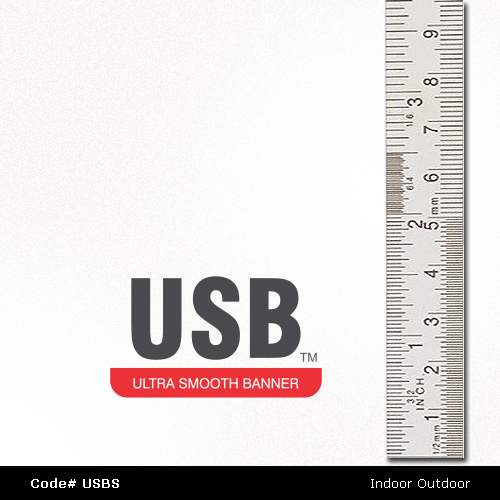 Comparison USB Ultra Smooth PVC banner is a scrim pvc vinyl material with ink on top without penetrating the fibres. The material is ideally suited for hanging banner and pole pocket. Excellent definition of graphics and powerful colors. Ink weights can be set at 400cc or higher offering amazing output of color gamuts. Comparison: USB is excellent color accuracy. Printed in CMYK digital process. Easy to attach with many fitting options including, banner stand tongue, silver nickel eyelets, hook n loop and pole pocket sleeves for securing banners to a pole. Large sizes may require seam joins. Note: Also consider Vplus+ or TEPRO600 Te-Pro Canvas or DCPU Display Chief poly fabrics. Actual Material (image dark for screen view only) of the surface/pattern. Color Whiteness = White 88% Creme 5% Black 12% (#USBS is a 'blockout' grade material and offers excellent results). #1 Final Size is unlimited, the size range is small to huge. Events may order one (1) piece or fifty (50) pieces all custom sized to suit their applications. USB is ideal for branding and bulk printing. Quantity discounts are available. USB is supplied to over 600 brands, agencies, designers and sign firms. Great for those agencies with high class corporate customers who need a genuine banner stand print that wont curl, fade, crack or peel. This material has been produced now for over 10 years with zero defect. Vinyl banners can be manufactured with pole sleeves, eyelet grommets and specialized features custom to your needs such as bottom tongue's for fitting to your banner stands. Pole Pockets, Hook n Loop, Tongue, Special fittings. USB is popular for hanging banners inside windows for retail window dressing and store posters.